In today’s world, Order and Pay facilities, available via the mobile phone in almost every customer’s hand, present added pressure on merchants to offer faster and more convenient payment options. Competition between rival lunch spots in a busy city like London means more than just offering better discounts or seasonal meal deals in today’s digital age. Many merchants are now looking to offer mobile payment options that allow customers to place an order via an app, and to collect their purchase when notified via text message. On one side, many newer FinTech entrants are able to provide businesses with mobile Order and Pay services, essentially completing with acquirers. However an existing acquiring bank would offer ease of implementation and trusted security measure. Mike Jennings, product manager, Clover & WoraPay, Lloyds Bank Cardnet, says the bank is focusing on the “value proposition” for merchants and looking beyond just reducing card fees for merchants. “In the competitive market in which we operate, it is extremely important to be able to differentiate ourselves, and WoraPay has helped Lloyds Bank Cardnet to do this when we have discussions with merchants,” says Jennings. There are a wide range of businesses that could benefit from an ordering system that allows customers to pay via their mobile phone and collect when their purchase is ready including: in-office catering; high street cafes; restaurants and pubs; sporting arenas; public transport; supermarkets and other retailers and ticketing agents. Jennings comments that by implementing mobile Order and Pay these businesses can realise a number of benefits. Businesses can increase efficiency by decreasing the amount of time staff need to spend dealing with long queues at the till. Offering mobile Order and Pay is also proven to increase sales. Based on the WoraPay proof of concept at Lloyds Banking Group and their in-house caterer Gather & Gather, more than 370,000 mobile orders have been processed to date. At some cafes this has reached 30% of all hot drink sales, with a 5.4% increase in card transactions since implementation. 25% of people are repeat users of the service. Customer insight is quicker to get and much more valuable with detailed order histories and easily integrated loyalty schemes. As a reward for commitment, businesses can send special offers straight to their customers’ phones. The WoraPay platform is integrated with bank’s acquiring technology, so transactions are processed by the bank. The service can be set up and launched within a day with no extra resource needed. It is completely secure and approved by the Financial Conduct Authority, and Risk and Compliance at Lloyds Banking Group. Installation is also made easier with additional support through Lloyds Bank Cardnet teams, dealing with acquiring related queries, says Jennings. Businesses can chose to use the WioPay wallet app, integrate the service into an existing app, or develop a proprietary branded app for a personal touch. “Lloyds Bank Cardnet is delighted to be working collaboratively with WoraPay to provide our clients with an innovative and simple solution, which significantly improves the customer experience and hence increases their sales potential,” says Tony Nash, managing director of Lloyds Bank Cardnet. For Lloyds Bank, offering its merchant partners services such as mobile Order and Pay, helps small to medium-sized business compete with large corporate brands, like Starbucks, says Jennings, which ties in to the bank’s commitment to Helping Britain Prosper. 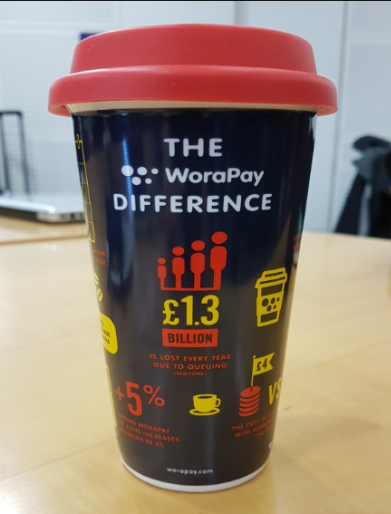 Offering the WoraPay Order and Pay service via Lloyds Bank Cardnet helps the bank “differentiate ourselves from our competitors” and shows Lloyds Bank as “an innovative acquirer, in line with our other solutions such as Clover and our Contactless Charity Donation device,” says Jennings. Learn more about how mobile app solutions can benefit your business here.